The F1FR-FS LO Flat Spray Sprinklers are designed for installation in accordance with CEA 4001 or EN 12845 (Automatic Sprinkler Systems – Design, Installation and Maintenance). The spray pattern created by this sprinkler makes this an excellent choice for applications with lower clearance above the suspended open ceilings and in racks. 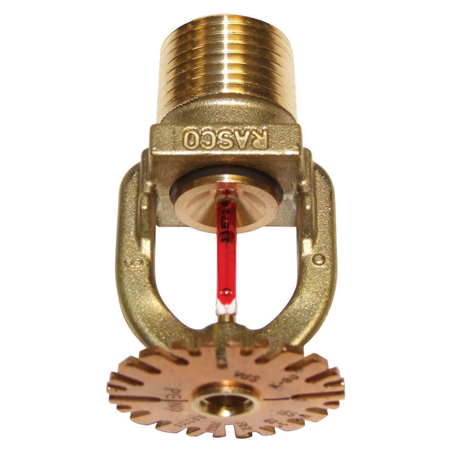 The F1FR-FS LO Flat Spray Sprinkler utilizes a frangible 3.0mm glass bulb. The glass bulb consists of an accurately controlled amount of special fluid hermetically sealed inside of a precisely manufactured glass capsule. This glass bulb is specially constructed to provide fast thermal response. At normal temperatures, the glass bulb contains the fluid in both the liquid phase and in the vapor phase. The vapor phase can be seen as a small bubble. As heat is applied, the liquid expands forcing the bubble smaller and smaller as the liquid pressure increases. Continued heating forces the liquid to push out against the bulb, causing the glass to shatter, opening the waterway and allowing the deflector to distribute the discharging water. The F1FR-FS LO Flat Spray Sprinkler temperature rating is identified by the color of the glass bulb capsule. Model F1FR-FS LO Flat Spray Sprinkler is used in concealed spaces, suspended open ceiling and in racks in accordance with CEA 4001 Sprinkler System Planning) and EN 12845 (Automatic Sprinkler Systems – Design Installation and Maintenance).